This is a beautiful print taken from an original pencil drawing by artist John Sutton. This is printed on quality canvas which has been stretched over a 20mm thick pine frame. This comes with a good quality Quartz Clock Movement (Battery Included). The image is mirrored on the sides of the canvas frame to create a wraparound effect. Signed by Artist John Sutton. The size of the canvas clock is 210 x 297 mm or 8 ¼ x 11 ¾ inch (A4). This print is the exact same size of the original artwork. WORLDWIDE POSTAGE. The canvas clock will be wrapped in bubble-wrap and will be posted in a strong cardboard box. WE HAVE MANY MORE CANVAS CLOCKS AVAILABLE - THIS IS ALSO AVAILABLE AS AN A3 or A4 ART PRINT - A3, A4 or A5 CANVAS PRINT - A3, A4 or A5 CANVAS CLOCK - A3 CALENDAR PRINT - ACEO SKECTH CARD - COASTER - FRIDGE MAGNET - KEYRING - MOUSE MAT. **WE ALSO HAVE A GIFT SET OF AN A4 CANVAS, A4 PRINT, COASTER, FRIDGE MAGNET, KEYRING, MOUSE MAT & SKETCH CARD AVILABLE FOR JUST £18.00. **EXAMPLES CAN BE SEEN IN THE LAST PICTURE. ** PLEASE VISIT OUR AMAZON STOREFRONT TO SEE ALL OUR PRODUCTS. 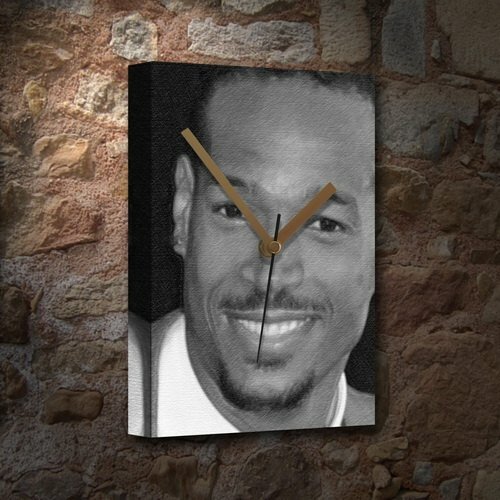 If you have any questions about this product by Canvas Clocks (A4) - Actors, contact us by completing and submitting the form below. If you are looking for a specif part number, please include it with your message.